Since 1981, nearly 2 million bicycles with the name ‘Gary Fisher’ have been sold worldwide, the majority of them for off-road use. Many hail the California native as the godfather of the modern mountain bike, but Fisher himself is quick to point out it was an open-source effort that made the mountain bike popular, launching a two-wheeled revolution in Marin County about the same time Steve Jobs and Steve Wozniak were launching a personal computer movement in nearby Silicon Valley. 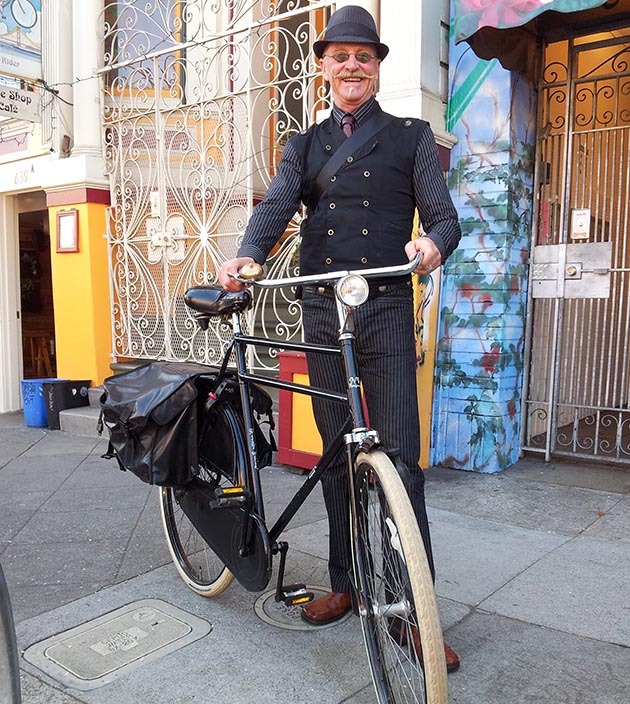 The 62-year-old eternal hipster cuts a recognizable figure around the world with his trademark mustache and diamond-shaped glasses, but the San Francisco resident is no poseur: Bicycling has saved this cat more than the nine lives afforded most people. From his early days racing road and cyclocross, putting on psychedelic light shows during the drug-fueled Janis Joplin/Jimi Hendrix/Grateful Dead era, chasing Olympic glory in the late ’70s, to launching a small bike company which revolutionized how Americans rode bikes, Fisher has managed to stay ahead of the curve, and out of the grave. He still alternates his daily riding schedule between road and mountain, enjoying the elevation of Mt. Tamalpais across the Golden Gate Bridge like thousands of others. The difference between Fisher and us? Your name’s not on the down tube, bub. Jens Voigt vs. Gary Fisher? 1. The same time Schwinn Stingrays were flying out the doors of bike shops in the early 1960s, a pre-adolescent Fisher was starting to race road bicycles in northern California, a region blessed with ideal terrain and climate for training and racing. The son of a budding architect, the young Fisher found freedom on the roads near his Bay Area home. The early `60s were still the age of innocence, and Fisher spent hours on his bike, without a care in the world. His ideal life on the bike shifted gears in his late teens, as racing’s governing body took offense to his long blonde hair and stipulated he get it cut or forfeit his license. He chose the latter, and poured his energy into shop class and creating things in his father's workshop. 2. Not one for math, science, reading or classroom structure, Fisher was good with his hands, and with the help of a friend, developed and manufactured an intricate light show for the budding Haight Ashbury music scene. He was close to the members of the Grateful Dead—whom he met when they played a three-day bicycle and music festival in Pescadero, California in 1966—and networked his way into San Francisco's music fraternity, which included Jefferson Airplane and Janis Joplin, whose members lived near Fisher in the area east of Golden Gate Park's 'panhandle'. Fisher's crew helped pioneer the psychedelic light shows of the late `60s, earning upwards of $1,000 a night before local concert promoter Bill Graham undercut them by offering $100 and backstage access to the bands to eager entrepreneurs. Despite being offered a chance to tour with the Grateful Dead, Fisher realized he'd have to pour $20,000 – $30,000 into his business to take his light show on the road. The Summer of Love was still in full bloom, and Fisher was in his element among musicians, managers and promoters. 3. In late 1969, the music scene was changing. The Beatles were ending their reign, Elvis Presley had made his big comeback, Sonny & Cher were losing their luster, and Led Zeppelin had introduced heavy metal. The Rolling Stones played a free concert for nearly 500,000 in London's Hyde Park in early July, days after the death of founding member Brian Jones, and were keen to repeat the effort in San Francisco. Somehow, Fisher sat in on the meetings leading up to the early December event, which was bounced around from one location to the next, starting with Golden Gate Park (city officials didn't want the hassle of the crowd expected), then Sears Point Raceway (ditto), before landing at Altamont Speedway near Livermore in the East Bay on December 6, 1969. Unfortunately for the Stones, whose manager Sam Cutler thought it a good idea to hire the Hell's Angels to provide 'security' in exchange for $500 worth of beer, neither the venue nor the logistics worked to plan, resulting in the beating death of local fan Meredith Hunter at the hands of a Hell's Angel, who said later he saw Hunter pull a gun and point it at the Stones' lead singer Mick Jagger. The Grateful Dead, which organized much of the event and brought in all the local bands, left the venue and returned to San Francisco due to the extreme violence and uncontrollable scene after Jefferson Airplane's lead singer was knocked unconscious during an early set. The extended Summer of Love was over, and the decadent decade of excess closed with a sad whimper. Fisher, despite his connection with the scene, decided to return to his bicycling roots, relocating to Fairfax, a sleepy hippie town 22 miles northwest of San Francisco in the long shadow of Mt. Tamalpais. 4. For Fisher, the music scene also reminded him what he missed the most about riding his bike: health, speed and adventure. Creating light shows was hard work, and rarely allowed for any extra-curricular activities (apart from drugs). With a clean slate and new lease on life, the 20-year-old stitched together a life built around his re acquaintance with the bicycle. "After I left the light show business, I worked at the Trident restaurant and Sunshine Bikeworks in Fairfax, Wheels Unlimited in nearby San Rafael, then with Charlie Kelly and Fred Wolf, cleaning up trees, cutting wood, moving furniture," Fisher explains. "From 4pm until midnight I worked at a liquor store. Fred would come by with a prime rib and we'd chow down together. "I was also doing bike tests for Bicycling Magazine—about one a month," he adds. "I was supplementing my income in multiple ways. I was racing bikes, and on some weekends made $100-$300 a week cash with Kent Bostick and Keith Vierra. When I was living with Charlie my rent was $150 a month." 5. Fisher's parents were living in posh Belvidere, worlds apart from Fairfax. His brother was doing was he was 'supposed to do' in his parents' eyes, leading a 'normal' predictable life. "That's when I wasn't getting approval ratings at home; I was a bike bum," Fisher says. "I lived to train and ride bikes. I really wanted to make it as a racer. To succeed, I should've gone to Europe like Mike Neel and Jock Boyer. I was a good team rider and could hang in there on the long distances. Anytime the race was over 100 miles I had an advantage." By the late `70s, Fisher, who was almost 30, saw his dream to race the 1980 Olympics scrapped by national cycling coach Eddy Borysewicz, who told Fisher he was too old to compete in Moscow. A local youngster named Greg LeMond was impressing everyone. Eddy B., as he's known, didn't make the final call after all: In late January 1980, President Jimmy Carter boycotted the Moscow Summer Olympic Games due to mounting tension between the two superpowers and the war in Afghanistan. Sixty-five countries followed suit. This was late summer 1979, the end of the racing season, but the beginning of the modern era of what was to be called 'the mountain bike.' By September, Fisher and Kelly opened a bank account with $600 and launched Mountainbikes. By 1996, the fledgling sport became an Olympic one, with the Gary Fisher-sponsored Paola Pezzo claiming its first gold medal in Atlanta.